Continuing with my QVC exclusive Tarte six piece beauty collection coverage, today we are going to be taking a look at what possibly may be one of the most flattering soft pinks I have ever worn-Tarte's LipSurgence Lip Shine in Smitten, a shade only available through this set. I think Tarte couldn't have picked out a better name for this product because "smitten" is exactly how I feel, when I look at the gorgeousness that is the color. You all know how much I love pink lip colors, and this blue-based, soft pink one is right up my alley. It's very wearable, too. This is one of those colors that would work nicely for either day, or night time looks. 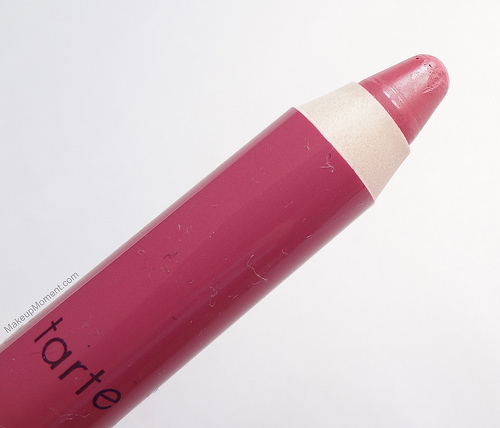 This lip pencil is much thinner in size than Tarte's full sized, chubbier LipSurgence pencils. Also, this one has a built in sharpener incorporated in the cap, whereas the full sizes don't. That's because the full size LipSurgence pencils have a retractable mechanism, and this one doesn't. I think it's pretty neat that this product comes along with it's own sharpener-great for traveling with, but I have to admit, I am not really fond of how awkward the cap looks as a result. It just seems too bulky and unattractive. I would have actually preferred that the sharpener be included separately, instead of on the cap itself. Just my preference. Tarte's Smitten LipSurgence Lip Shine contains a peppermint fragrance that gives my lips a comforting, refreshing and cooling tingle. The scent, along with the cooling feeling, don't stick around for long. After initial application, they dissipate within 5 minutes. This lip shine has a creamy texture that makes it a pleasure to apply, and it imparts a healthy looking shiny finish, that looks amazing on the lips. Albeit a bit tacky to the touch, it feels pretty comfortable and lightweight on. This product doesn't cling to dry areas I may have, so my dry lips definitely approve. Because of it's creamy nature, Smitten doesn't do very well when it comes to lasting power. The longest wear I get out of this is anywhere from 2-3 hours-and that's without eating or drinking. If I eat or drink a beverage with this stuff on, the color disappears within a few minutes from doing so. Luckily, reapplication isn't troublesome and I can get the same fresh application look, without worrying about product build-up on the lips. Overall: Ever since I first tried this lip shine, it has been a constant occupant in my makeup bag. When I am on the go and need a quick burst of color on the lips, this is what I have been reaching for. Smitten is a beautiful color that I simply can't get enough of. The lasting power could be better, but since I love the color, texture, and finish so much, I can possibly overlook that bit. 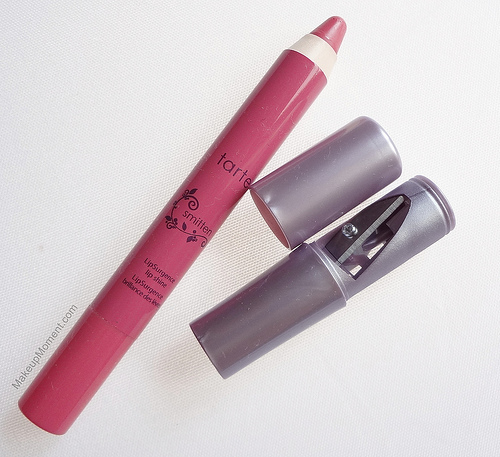 I am curious as to weather Tarte's fuller sized LipSurgence lip pencils fare better in the lasting department, than this one did. I most definitely plan on trying a few of those in the near future, as I know many can't get enough of them. 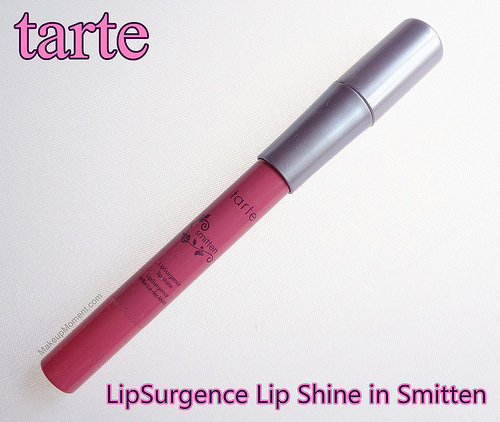 What do you all think of Tarte's LipSurgence Lip Shine in Smitten? Have any of you tried Tarte's full sized LipSurgence pencils? The color is soooo pretty! This is a really great review! I can understand why you reach for it in your makeup bag, lovely color. The sharpener is horrible. I don't know if every one is like that, or if I just got a bad one. But I don't feel like the pencil goes far enough into the sharpener to get sharpened evenly, and then if I have to try to force it in there it doesn't sharpen well and I feel like it wastes a lot of the product just trying to sharpen it. Have you had problems with the sharpener also? I am sorry to hear that you are having trouble with the sharpening of the pencil. I agree that because it doesn't go all the way in, it can make the sharpening experience a bit challenging. What I do is push the pencil in gently, and slowly but carefully start to sharpen it. Sometimes I get a botched up point, but then some days I get an almost clean, crisp point. You just have to play around with it and find a way that works best. I appreciate the inclusion of a sharpener, but I really do wish that this pencil had a retractable mechanism, just to make things easier.